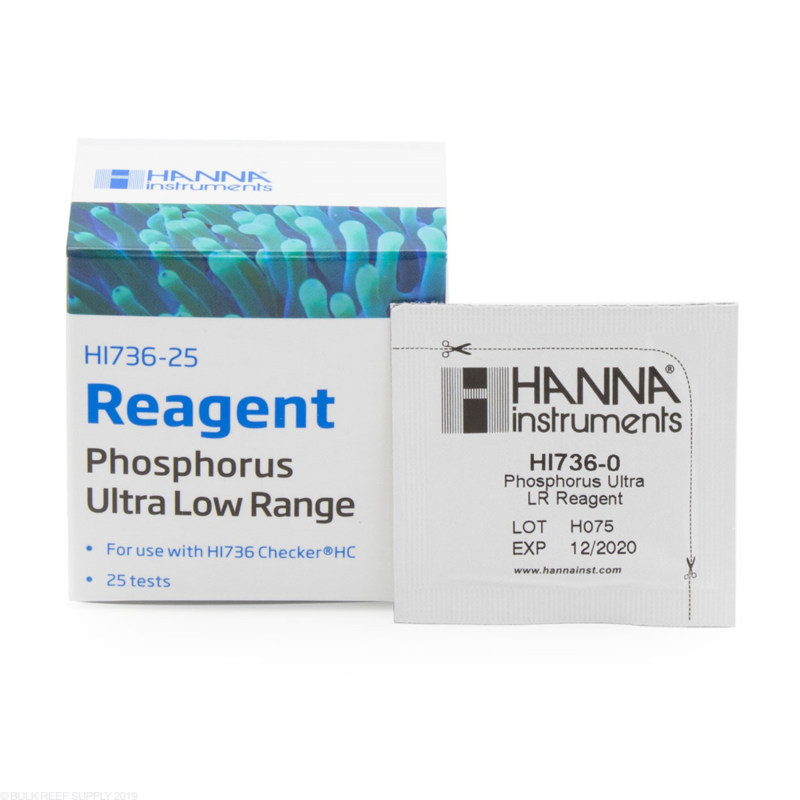 Phosphorus Ultra Low Range reagent refills for the easy to use, handheld Phosphorus ULR Colorimeter HI736 Hanna Checker HC - Marine Water. I switch to the ULR checker because the standard low range checker was giving me a .00 reading. Glad I did it! The key to this is to keep the glass clean and to face the glass the same direction every test. I handle the tubes using a fiber free cloth between C1 and C2. We're talking PPB here, a little smudge can throw the reading. If you face the 10ml stamp outwards every time time you can ensure another level of consistency. Anyway, I really like this tester but I think Hanna should provide a fiber free glass cleaning cloth for handling!! If you really want to know, then Hanna is the only way to go. It's the only one that is accurate enough and has the low end resolution that you actually need. Although purchasing the HI-736 checker was initially expensive, only having to purchase the reagents periodically is relieving. The end result is greater peace of mind than I got using other test kits. Have used for many years. The last couple of refills seems to require less shaking to get it to dissolve. I don't know if they changed something but dissolved better now. The was always my biggest complaint was how vigourous you had to shake it and sometimes the checker would shutdown before you ever finished getting it to dissolve. These packets are just fine. The manufacturer obviously used this packaging assuming that most people had common sense enough to be able to use it. All you have to do is cut along the line, fold into a funnel and pour it in. I actually have my 5 year old doing this for me on a regular basis. Hasn't lost a test packet yet. Best way I've ever tested phosphates and gives accurate low readings you cant get with other test kits. My only complaint with running the test is these little packets of reagent. They are not the easiest thing in the world to work with, although I am getting better with practice. The powder inside each of these reagent packets is very fine and difficult to get out of packet and into the tiny top of the test vial quickly without spilling a bunch of it. I tried a tiny plastic funnel once but the powder is so fine a lot of it stuck to the funnel so I was worried this may skew the results of the test. I think I would much prefer to have the powder in a little jar with scoop and then would probably be able to say 5 stars. 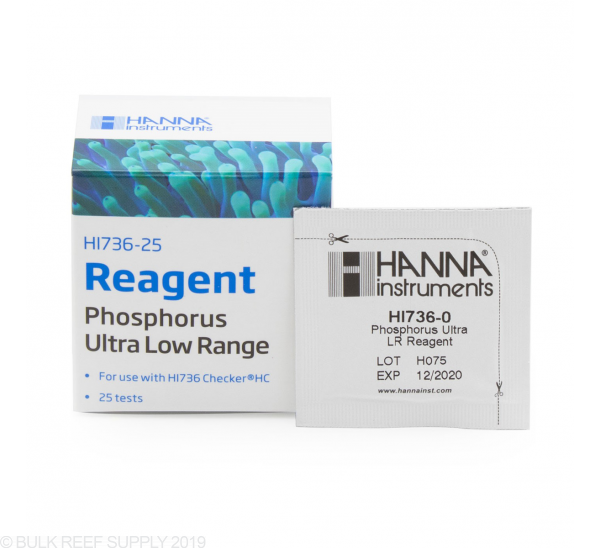 The Hanna Phosphorous Checker lets you know how much total phosphate and potential phosphate is in your tank by measuring total phosphorous. A simple equation gives you the best overall view of phosphate in tank. I will continually use this system until a better Hobbyist level test is created. so far so good! Getting better at using the equipment, preparation the key.